Just like a real vacation, the more you plan for fun, the more successful your Staycation is likely to be. Start by setting a reasonable, realistic budget for your week of fun at home. Set some money aside for activities, eating out, and perhaps even paying for a splurge or two such as paying for a house cleaner or treating yourself to a massage or pedicure at a local spa. Next, take the time to figure out just what you will do on your Staycation. If your kids are old enough to have an opinion, hold a family meeting to discuss your ideas and to get a feel for what everyone wants to do. (The list below is a great start!) If you like spontinaeity, consider putting everyone’s ideas into a jar, then picking one activity each day. Or, if your family prefers more structure, use your ideas to develop an itinerary for the week. Be sure to also spend some time prepping your home and kitchen to make things as easy—and neat—as possible for your relaxing week at home. Gather menus to all the local restaurants that offer takeout and delivery or, if eating out every day is not an option, plan a freezer cooking session ahead of time to prepare a week’s worth of easy stress-free meals. You might also want to consider using disposable dishes and serve ware to cut down on dishes. Make sure to caught up on laundry before your week begins, and, if possible, do a family power-cleaning session the day before your Staycation starts. Try Geocaching-According to the official Geocaching website, “Geocaching is a real-world, outdoor treasure hunting game using GPS-enabled devices. Participants navigate to a specific set of GPS coordinates and then attempt to find the geocache (container) hidden at that location.” Get more information here, or find local Geocaching groups here. Take a Virtual Museum Tour-Several amazing museums throughout the country and the world offer “virtual” tours. You can choose from the Smithsonian Natural History Museum, the Indianapolis Children’s Museum, the Boston Children’s Museum, the Miami Children’s Museum, or even visit the Louvre in Paris or even the Sistine Chapel at the Vatican in Rome. Pretty cool! Try Paintballing or Laser Tag-Invite a few other families to join yours and battle it out for the title of Most Awesome Family. There are paintball or laser tag facilities almost everywhere—use Google to find one nearby. Visit a Nearby National Park-National parks truly are one of our country’s greatest treasures, and most NPs have a variety of awesome family friendly activities to choose from. After finding a park in your area, first visit the Ranger Station to pick up a Junior Ranger kit, then complete the required number of activities to receive a badge. You can also purchase a Passport to National Parks at any NP gift shop, then collect passport stamps at every park you visit. Most park fees are nominal, but you can also check out this page to find free entrance days. Enjoy Your Local Theater-Check the local newspaper or theater website to see what plays, musicals, concerts, or family-friendly comedy shows will be playing during your planned Staycation time, then book tickets and plan for an evening at the theater. Visit a Nearby Amusement Park-While Disney World may not be in the cards this year, that doesn’t mean you can’t still have a blast at a nearby theme park. Check out this list to find an amusement park in your own state or town. Visit a Local Children’s Museum-If you’ve got younger kids it can sometimes be hard to find activities that the whole family can enjoy, but a great Children’s Museum can definitely fit the bill! Most have a variety of fun and interactive activities that can keep you busy the whole day. Check out the Association of Children’s Museums website to find one in your area, and consider purchasing a Family pass—you can usually get your money back in just two visits. Visit the Zoo or Aquarium-Who doesn’t love seeing animals? Check out the Association of Zoos & Aquariums to find an AZA accredited zoo or aquarium in your area, then be sure to also check what special programs your zoo has available. Some offer Junior zookeeper programs or opportunities to feed the animals, while some others even allow you to spend the night in the zoo! Be sure to pack a lunch to save on pricey zoo fare! Check out the Local Library-Most libraries have family-friendly events and activities happening every weekend, and sometimes even daily during spring break and summer vacations. Check your local library website for details. Major or Minor League Sporting Event-While major league events are a lot of fun, they can get pricey quickly, especially for a family. Luckily almost every city has a minor league team these days, which can give you (almost) the same experience for a fraction of the price! Be sure to check out which days include special events, such as free caps or fireworks for added fun! Host a Family Board Game Tournament-Invest in a few new board games, then set up snacks and drinks for a marathon board game tournament! For game ideas, check out my family’s favorite board games here, or else just look at Amazon’s current bestsellers. Go Bowling-If your kids are small, try bumper bowling; for older kids go at night during “glow bowling” times! Many bowling alleys around the country even participate in a free bowling program that allows kids to bowl free and parents to join them for just a few dollars more. Camp in Your Own Backyard-Why not enjoy the great outdoors in your own backyard? Set up a tent and sleeping bags, build a fire (or use the grill) to cook s’mores, and take turns telling ghost stories. Then download the Night Sky app (make sure your device is GPS-enabled first!) to identify stars, planets, and even satellites in the sky. Tour a Local Factory or Brewery-Is there a large manufacturing facility near your town or city? Most offer tours and even samples of their goods. Check the company website for details! 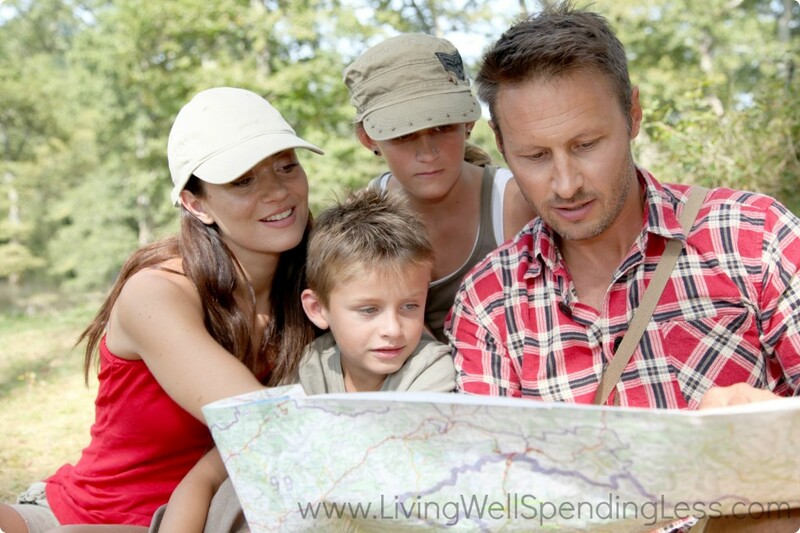 Visit a Nearby Tourist Spot-Is there an area nearby that always draws the crowds? Even if you normally avoid the tourist traps, every once in a while it is fun to become a tourist in your own town. Make all the cheesy stops and take pictures along the way! Go Paddleboarding or Canoeing-If there is a river, lake, or ocean nearby, chances are pretty good there is also a paddleboard or canoe rental facility nearby as well. Both are a fun way to enjoy the water and test your skills! Create Your Own Art-Spend an afternoon getting creative at a nearby paint-your-own pottery facility. Not only is it fun, you’ll have your own gorgeous dishes to take home when you’re done. Get Wet-Spend the day at a local pool or waterpark, or just head to the beach! If that sounds like too much effort, simply set up a slip & slide in the backyard and have a family water day at home. Tackle a family project-Have the kids been begging for a tree house or wanting to redecorate their rooms? Consider spending your week together working on something to improve your home. You’ll not only bond while painting and building together, but at the end of the week have something concrete to show for your time! Host Your Own Film Festival-Pick a theme, allow each family member to pick a movie, then get comfortable for a day of movies. Be sure to provide plenty of snacks, and take breaks to discuss and rate each film. Give Yourselves a Makeover-Do hair and makeup at home, or take a day to go to the local spa or beauty parlor. Complete the new look with a new outfit! Find a Local Festival-Check your local newspaper or chamber of commerce website to find out what is happening in your town or towns nearby the week of your Staycation. Depending where you live there are often events happening almost every weekend! Go Golfing-If dad is into real golf, consider spending an afternoon doing a family golf lesson; otherwise, stick to mini golf at a local novelty course! Play Outside-Go fly a kite, take a walk, go for a bike ride, or take a hike–most state and national parks have at least a few walking, hiking, or biking trails to choose from. Do a little research to find one that fits your family’s athletic ability, then head out to enjoy the great outdoors. Don’t forget to pack snacks and water for your trek! For most people—and moms especially—the hardest part of trying to “relax” at home is letting go of the all the everyday obligations and distractions that bombard us in our own homes. But the key to having the best Staycation ever ultimately has nothing to do with the activities you choose, but with your own attitude and commitment to making your week a time of fun and relaxation. Let the chores be for a week and instead give yourself permission to kick back and enjoy the moment. Laugh and talk with your kids and spouse and create memories that you will cherish for a lifetime. This is your time…..make the most of it!